To obtain more explicit and easy to read reinforcement drawings, we can create reinforcement drawings for every structural element. In most cases we order the materials from two or more reinforcement drawings. Using Advance Concrete you have the option to order materials from several different drawings of the same project or different projects. This option is very useful for those who use the Multi-user function. In this example we have two reinforcement drawings from two different Advance Concrete drawings. The reinforcement drawings are from the same project, for example, "Slab reinforcement drawing" and "Beams reinforcement drawing". To order the steel from these two drawings perform the following two steps. The first step is to copy the drawings in the same folder. Set a Project ID for these drawings. 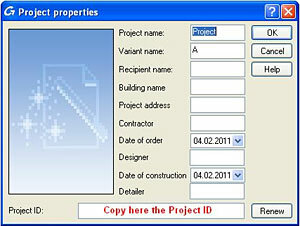 The Project ID is in the project properties window. To access this window use the Properties option from the Pilot, by right clicking on Project. 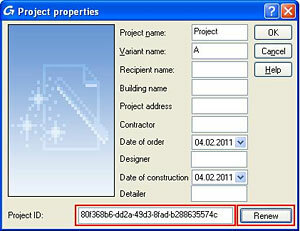 In the Project properties window generate a Project ID using the Renew option. To validate the ID click OK, and then save the drawing. Copy the Project ID from the first drawing to the second, click OK and save the drawing. From now on the material order can be made from the selected drawings. The second step is to perform the actual command. The material order can be done in one of the two drawings. To order the materials use the Materials quantities manager option from the Pilot or the Materials quantities manager option from the Advance Model toolbar. 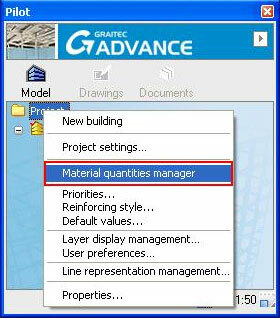 In the Material manager window use the New option to set the order properties, such as production system, description, job name, etc. 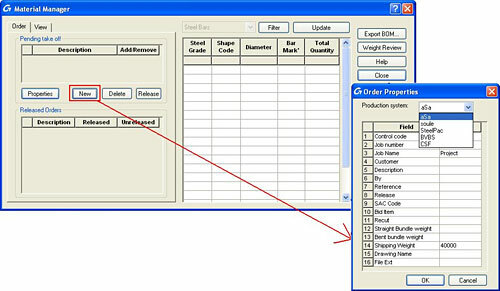 To add materials to the new order use the "+/-" option (Add/Remove) from the Material manager window. In this window choose the drawing for the new order. Another way to choose the drawing for the new order is to use the Views option from the Material manager window. If the drawing for the order is not open, a warning message appears, in which you are asked if you want to open the drawing. With this functionality you can perform orders from multiple drawings. After choosing the files and the reinforcement drawing for the order, the other steps in performing the order are identical to those used in simple orders.